Recently, Americans sat down together to eat, socialize, and watch football, commercials, and the most popular concert of the year. As the most watched telecast in U.S. history—this year’s event was watched by 114.4 million viewers—the Super Bowl promises a grand spectacle. This year featured a very competitive game between the New England Patriots and the Seattle Seahawks that was decided in the last minute of the game. We asked some Humphrey Fellows in Boston and Seattle what their experiences were like. Although Humphrey Fellows are only at their host campuses for ten months, they feel a sense of belonging and allegiance to their American football teams. Many Fellows made it a priority to watch the game and support their team. When asked who they were supporting, Jean-Bosco Abderamane at MIT said, “Of course my team was the Patriots.” Fadoum Sy, at the University of Washington, said “Even if I am living temporarily in Seattle, I feel like a real citizen and the team is mine, too.” Others felt that by just living in their respective cities, becoming a fan of their NFL team was inevitable. 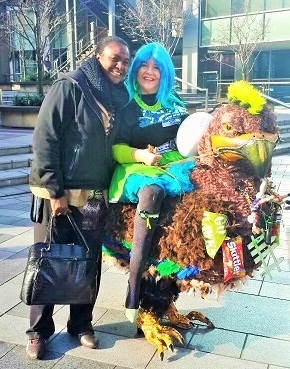 Kanwal Ali, also at the University of Washington, said he chose to support the Seahawks, “simply because one cannot live in Seattle without being a Seahawks fan." Another aspect of the game that Fellows remarked up on was the passion of American football fans. Biwa remarked, “When people believe in something, they go to great lengths to show support.” Basilios Peftouglou, at the University of Washington said, “Seattle is my city, my home, the place where I am living one of the most wonderful years in my life. And I like the passion that this city has with its team!